Seven months into her pregnancy, Rachel Samstat discovers that her husband, Mark, is in love with another woman. The fact that the other woman has 'a neck as long as an arm and a nose as long as a thumb and you should see her legs' is no consolation. Food sometimes is, though, since Rachel writes cookbooks for a living. And in between trying to win Mark back and loudly wishing him dead, Ephron's irrepressible heroine offers some of her favorite recipes. Heartburn is a sinfully delicious novel, as soul-satisfying as mashed potatoes and as airy as a perfect soufflé. It was honestly a little too bourgeois for my taste but Meryl Streep did a fabulous job. While the book is funny in some places, it begins to drag in the middle. 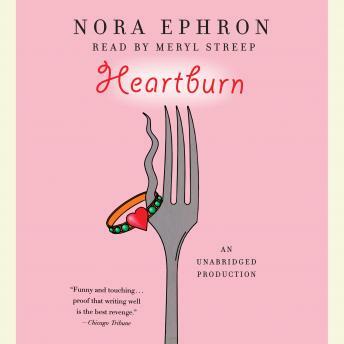 The audiobook of Heartburn was good, but i needed to hear it twise to undersand all. The narrator was super. Difficult to follow and felt cluttered.